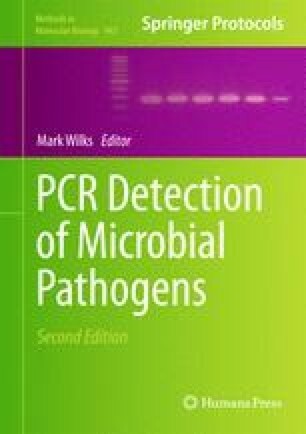 Our aim was to develop and evaluate sensitive methods that would allow simultaneous direct identification of multiple potential pathogens in clinical specimens for diagnosis and epidemiological studies, using a multiplex PCR-based reverse line blot assay. We have previously developed assays suitable for detection of bacterial respiratory and systemic pathogens. In this chapter we describe, in detail, a method developed to identify 14 genital microorganisms, for use in epidemiological studies of genital infection or colonization, using first voided urine specimens. The 14 urogenital pathogens or putative pathogens studied were Trichomonas vaginalis, Streptococcus pneumoniae, Neisseria gonorrhoeae, N. meningitidis, Chlamydia trachomatis, Ureaplasma parvum, U. urealyticum, Mycoplasma hominis, M. genitalium, Gardnerella vaginalis, Haemophilus influenzae, herpes simplex virus 1 and 2, and adenovirus. Two species-specific primer pairs and probes were designed for each target. The method was validated using a reference strain or a well-characterized clinical isolate of each target organism. In a clinical study among men attending sexual health clinics in Sydney, we used the assay to compare rates of detection of the 14 organisms in men with urethritis with those in asymptomatic controls and found the method to be sensitive, specific, convenient, and relatively inexpensive. Victor Weixiong provided some of the primer/probe designs. Dr Neisha Jeoffreys provided valuable advice and help with troubleshooting of initial problems, false positive results, and excessive background signals.